Topics: Mike's, Mike, Alachua, Fl,, and Altamonte Springs. 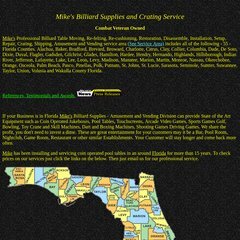 mikesbilliards.us Mike&apos;s Pool Table Movers and Refelting Service Central Florida .. The estimated 47 daily visitors, each view 2.10 pages on average. It is hosted by Yahoo Inc (California, Sunnyvale,) using YTS/1 web server. Its local IP address is 68.180.151.96. yns1.yahoo.com, ns9.san.yahoo.com, and yns2.yahoo.com are some of its 4 Nameservers.